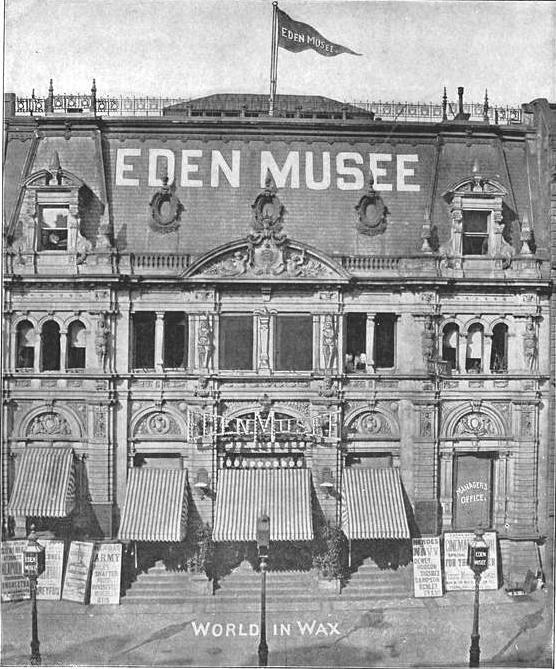 Daytonian in Manhattan: The Lost Eden Musee -- "The Wonders of the World in Wax"
The Lost Eden Musee -- "The Wonders of the World in Wax"
On March 28, 1884 when the Eden Musee opened to the public, 23rd Street was the bustling entertainment center of Manhattan. Located at 55 West 23rd Street, the Musee faced the fantastic white marble Booth Theatre across the street at the corner of 6th Avenue. 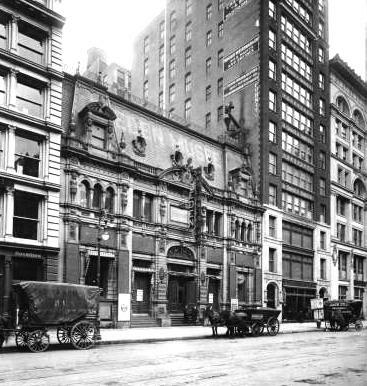 The famous Koster & Bial’s Music Hall was just down the street, the Grand Opera House sat at 23rd and 8th Avenue and numerous other theaters dotted the thoroughfare. The Eden Musee would be unlike any of them. The building, constructed mainly of imported Ohio sandstone, was a flamboyant mixture of styles. A high mansard roof with ornate iron cresting sat above a balustrade cornice, broken by a Renaissance-style closed pediment encasing carved sea nymphs. Six full-figure caryatids at the second level stood on rusticated and carved pilasters that separated the five entrances, slightly above sidewalk level. The structure dripped with carved ornamentation and promised wonders within. The opening ceremony was attended by the mayor, a judge, a former senator and various bankers and businessmen. Unfortunately, over-confident planning resulted in only about half of the figures being on display at the opening. Later that year, in September, Hollaman managed to book the Sioux Chief Sitting Bull and some Indian braves for a week who were to “give representations each day of wild life on the plains.” Intrigued, 60-year old lithographer John Kirkland Gardner who lived on 21st Street paused to read the Sitting Bull advertisements outside the Musee. A gust of wind caused one of the flags on the building to snap into one of the 300-pound stone urns on the balustrade above, dislodging it. The urn crashed squarely on the head of Gardner who was killed instantly. Despite the rocky first year, the Eden Musee attracted huge numbers of visitors, greatly due to the marketing genius of Richard Hollaman. As was the case with Sitting Bull, he sought unusual and exotic acts to draw in the public. In 1887 the Eden Musee staged New York’s first orchid show “when the flower was new to society,” according to The Times. The flower show became an annual event. In October of 1889 Hollaman introduced New Yorkers to female Viennese fencers and dancers. Referred to by The New York Times as “muscular young persons,” they wore short dresses and high-necked military bodices – daring enough in the 1880s to cause considerable notice and considerable attendance. It was during the staging of this act that the Musee introduced Erdelyi Naczi’s Hungarian orchestra. Before long every wealthy socialite in Manhattan sought out the orchestra to play at her receptions or dances at an astounding $1000 per session. A 10-foot papier-mache and wax turban-wearing “automaton” named Ajeeb was installed in 1886. Constructed by Englishman Charles Edward Hooper, it would play chess with any challenger – including O. Henry, Sara Bernhardt and baseball player Christy Mathewson. Patrons were amazed at the skill of the robot, unaware that Hooper was inside the dummy operating it. Always at the cutting edge of entertainment, the Musee was a pioneer in motion pictures movies, producing in 1898 a cinematic version of “The Passion Play” which ran for nine months. Filmed on the roof of the Grand Central Palace hotel, the film was 2000 feet in length at a time when the average was 500 feet. In 1897 the museum was the only New York theater to show motion pictures as a permanent feature; screening them in the Winter Garden, which could accommodate an audience of 2000. Ironically, it was the movies that would bring the end to the Eden Musee. The first of the problems came on June 14, 1897 when the cinematograph started a fire that sent 1,500 patrons stampeding to the exits. The theater minimized the near-disaster to the press and business went on. By the turn of the century, however, the 23rd Street neighborhood had drastically changed. The department stores along 6th Avenue were moving north of 34th Street and the entertainment district was migrating to Broadway and 42nd Street. In 1914 there was only one other theater left on 23rd Street, Wallach’s, and a year later that was closed. Worse, though, the crowds that once flocked to see the wax works were now more interested in moving pictures. The very invention that the Eden Musee once pioneered was now dooming it. On June 7, 1915 the theater filed for bankruptcy. “The Eden Musee, which has stood on Twenty-third Street near Sixth Avenue and shown ‘the wonders of the world in wax’ for more than thirty years, has its days numbered,” announced The New York Times. 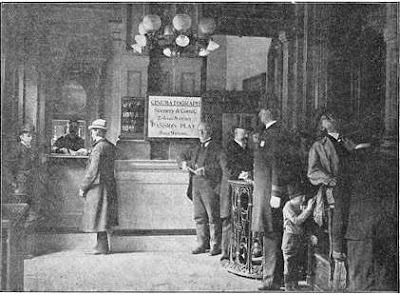 When the Musee closed it doors for the last time that year, the ticket taker was the same one who stood at the door on opening night 1884; the manager that opening night, Edmund G. Dagnell, was also still working; and Louis Jackson, who sold tickets, had been there 21 years. Ajeeb the chess-playing robot was packed and shipped to Coney Island and the wax figures were distributed world-wide. 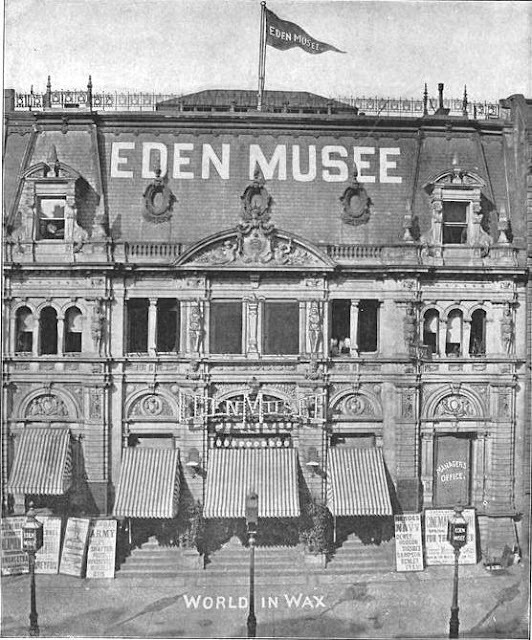 Within a matter of years the grand Eden Musee was demolished, replaced by a soaring 12-story loft building. For this type of question please use my email address (above left) so readers do not have to become mired in back-and-forth discussion of issues not related to the post. Thanks so much. Heartbreaking that the building is no longer there. Sounds mind-boggling. Thanks for this write-up.